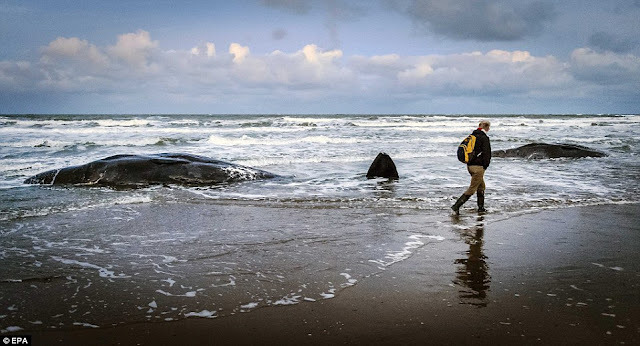 On 16 February 2014, two sperm whales beach on the Danish West Coast of the North Sea. 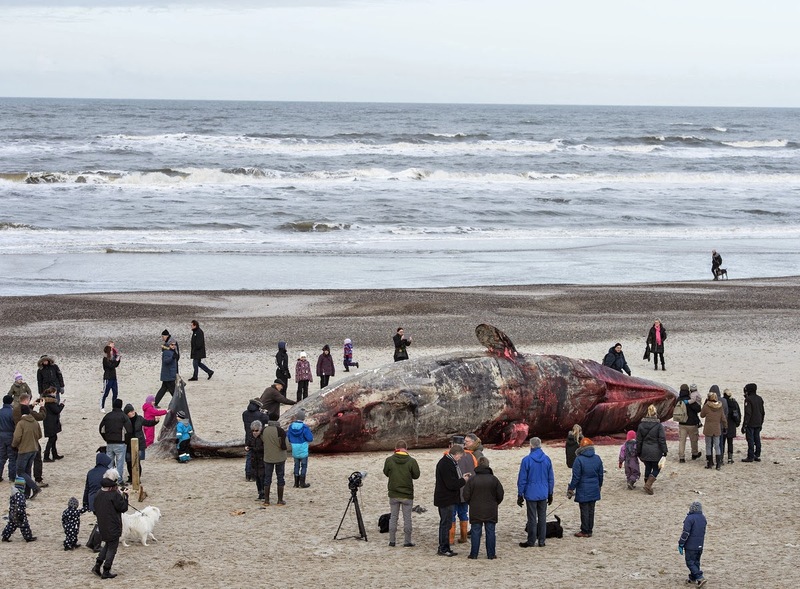 Six days after the Danish beachings, a dead sperm whale was found on the beach in Kent, UK, 400 miles downstream from the Danish Coast stranding. Sperm whales often strand in this fashion. It is reasonable to assume that these 3 stranded sperm whales are all from the same pod. In keeping with the earthquake theory, these whales were injured by a magnitude 5.3 earthquake (USGS) that occurred in the Greenland Sea on 16 January 2014 ( 08:14:46 UTC - 09:14:46 local time) The epicenter was located at 73.7856N --- 8.5432E; depth of focus shown as 10 km, a default depth for oceanic EGs. The European geosite list this event at Magnitude 4.9 with a focus at only 3.1 km below the ocean's surface. In my opinion, a mag 4.9 at 3.1 km is more whale-dangerous than a 5.3 at 10 km. The 3.1 km depth at the European site is calculated by a geophysicists. The German geofolks rate this event at 5.1 and show it as thrusting-- the most dangerous type of earthquake for diving whales. They list a default depth of 10 km below the ocean's surface. The event was thrusting, the motion in the seabed was mostly vertical. The big question is how did these whales get from the Greenland Sea through the Norwegian Sea and into the North Sea. Under normal condition, the current does not flow from this epicenter into the North Sea; however, this has been an exceptional year with winter storms moving off the US and Canadian shores, sweeping into the Norwegian and Greenland Seas. Sorting out the wind and weather in the area is gonna take a trained and experienced oceanographer. So... I can not draw a line from the epicenter to the beach in this event, but feel certain that this whales were injured in the Greenland Sea and the above quake was the only event that could have caused it. Below is a video that might explain how these sperm whales landed at Denmark.